Compact, reliable and very good value. This range of DC Inverter high wall units in plain white are as good as we have come to expect from Fujitsu, one of the worlds leading manufacturers of air conditioning heat pumps. Ideal for either domestic or commercial applications. They also have an amazing efficiency ratio, with a return of up to 4.39kw heat produced per kw of power used. They are installed by removing the brick work and putting the unit straight through the wall on a chassis. From only 420mm high they Fit on nearly all dwarf walls, a majority of the unit is recessed, so internally they are nearly flush with the wall. Ideal where interior space is of a premium. Also heating mode is usually limited when outside temperatures drop below -5C. Fujitsu’s new concealed floor duct unit is perfect for those who do not wish to have a system on show. A concealed system can be built in to a cupboard or even in to a wall. At only 595mm high & 217mm deep this versatile system can also be installed at ceiling level as it has rear or underside air intake options. This range of DC Inverters are as good as we have come to expect from Fujitsu, one of the worlds leading manufacturers of air conditioning heat pumps. Ideal for either domestic or commercial applications. They also have an amazing efficiency ratio, with a return of up to 3.73 kw of heat produced per kw of power used. They are E.C.A listed which means tax incentives are offered for commercial installations. These systems are suitable for the home & commercial applications. 'A' Rated on cooling & heating, one system could heat & cool an average 3 bedroom house upstairs, keeping every room at an even temperature throughout the year. At only 270mm high even these larger units will fit neatly in to a loft space. They are also available with a lower energy rating options, which in addition to being slightly cheaper, often use smaller outdoor units. 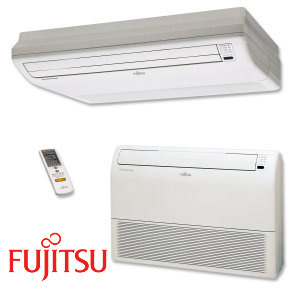 Fujitsu offer excellent quality with highly impressive reliability and efficiency figures. This range of DC Inverter ducted units are as good as we have come to expect from Fujitsu, one of the worlds leading manufacturers of air conditioning heat pumps. Also benefiting from 3 years Fujitsu warranty. Installation by an air conditioning engineer is required. Pipe Size (Gas & Liquid): 5/8" / 1/4"
Although these systems are not 'A' rated on cooling & heating, which in means they are slightly cheaper than the 'A' rated systems, but they also often use smaller outdoor units. one system could heat & cool an average 3 bedroom house upstairs, keeping every room at an even temperature throughout the year. At only 270mm to 400mm high even these larger units will fit neatly in to a loft space. These ceiling cassettes all fit neatly into a 600 * 600 ceiling tile and at only 245mm deep they need little space above the ceiling. They are also available at a reduced price with an energy rated B option. This range of DC Inverter high wall units in plain white are as good as we have come to expect from Fujitsu, one of the worlds leading manufacturers of air conditioning heat pumps. Ideal for commercial applications. These ceiling cassettes usually fit into the centre of 4 ceiling tiles and at only 286mm deep they need little space above the ceiling. Pipe Size (Gas & Liquid): 5/8" / 3/8"
An intelligent approach to air conditioning with a single unit that is equally at home standing upright as a floor unit or fitted horizontally to the ceiling. 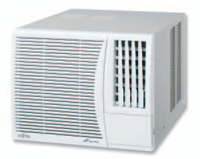 Either choice provides the user with a slim, lightweight air conditioner that employs Double Auto Awing louvre technology that distributes air evenly throughout the room whether at floor or ceiling height. The newly developed Super Vane feature boosts air flow throughout the room by directing air to all corners of the room. 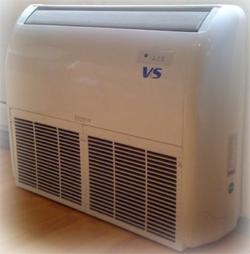 Other system features include: Automatic Air Flow Adjustment to match changes in room temperature, Automatic Restart after power failure, and with the heat pumps models, Auto-Changeover from heating or cooling to maintain room temperature. Hand held or wall fixed remote controllers puts the user in control: start/stop, timed programmes, temperature settings, fan speed control, air flow direction, and more. 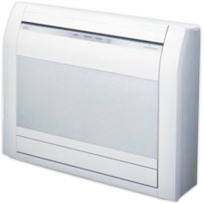 Hitachi's wall mounted units from the Summit range of Room Air Conditioners are available with heating and cooling capacities from 2.0kW to 9.3kW and offer many benefits. For high efficiency this system is amazing!!! Hitachi have recently released this market leading product to their portfolio, it boasts heating efficiency ratio’s of up to 6.36kw to 1kw and Hitachi boast of only £17.00 per year to running costs. Need we say anymore, these impressive figures puts every thing else in the shade and will turn your carbon footprint into a carbon finger print whilst saving a fortune on your heating bills. 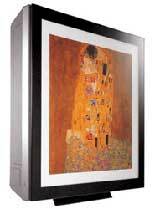 Part of the Artcool range the ‘Gallery’ has an unprecedented feature which allows you to use the front panel as a picture frame. You can replace the supplied design with a picture or photograph of your own. In addition to the high efficiency heating & cooling ratio’s, LG’s Artcool range include a unique Neo Plasma air purifiying system, using 5 stages of filtration to remove airborne bacteria’s, mould and odours. The new Zen Series is a black wall mounted system that blendsenergy efficiency with a sophisticated, streamlined design. Combining an impressively low power consumption with a quiet, yet powerful performance, these units feature a weekly timer as well as the Nano-Platinum filter system - incorporates nanometre sized platinum-ceramic particles that generate stable antibacterial and deodourising effects. Offering industry leading noise levels, units have a distinctively styledfront panel that not only looks appealing, but also helps to makecleaning of the unit easier. These versatile units can be installed at either low level on a floor or on a ceiling. 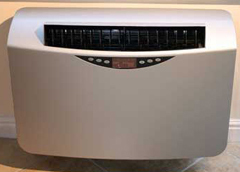 These systems have been built using the reliability of Toshiba / Hitachi Components. 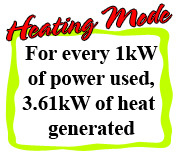 Heating efficiency ratio of up to 3.33kw of heat produced for every kw of power used. At this price these stylish units are not likely to be around for long.